Hello, friends! I hope you are all having a restful and warm Sunday. We’ve just returned from church (we were late) and brunch (we were loud), and the kids (plus Andrew) are gearing up for naps. Time for me to plop myself down and write! I shared a peek at a recipe I’ve been using for quite awhile yesterday on Instagram and received so many messages on how to make it. Here you are! So long story short, Theodore has really dry, sensitive skin, and ever since he was itty bitty, has been experiencing dreadful eczema flair ups now and again. He will go months with not a patch on him and then bam! He’ll have seven. I am sure it has a lot to do with his diet (hey ho gluten, hey ho dairy, hey ho sugar), and some to do with the changing of the weather, but any way you shake it, it’s miserable and has is mama makes me feel so bad for him. I am going to try and start limiting certain foods from his diet and do more gut-related research and see if that makes more of a long-term difference, but in the meantime I made a healing salve for his skin. 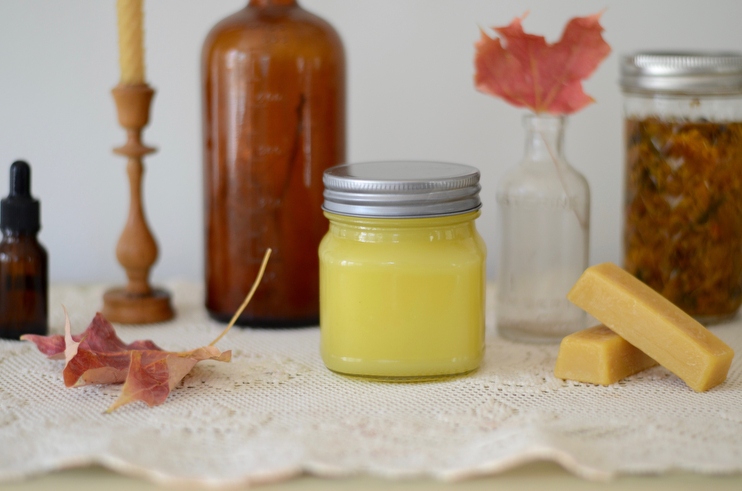 It is very similar to one I used to make when he was a baby, but this one has more calming ingredients and is much more salve-y in texture, which I like. 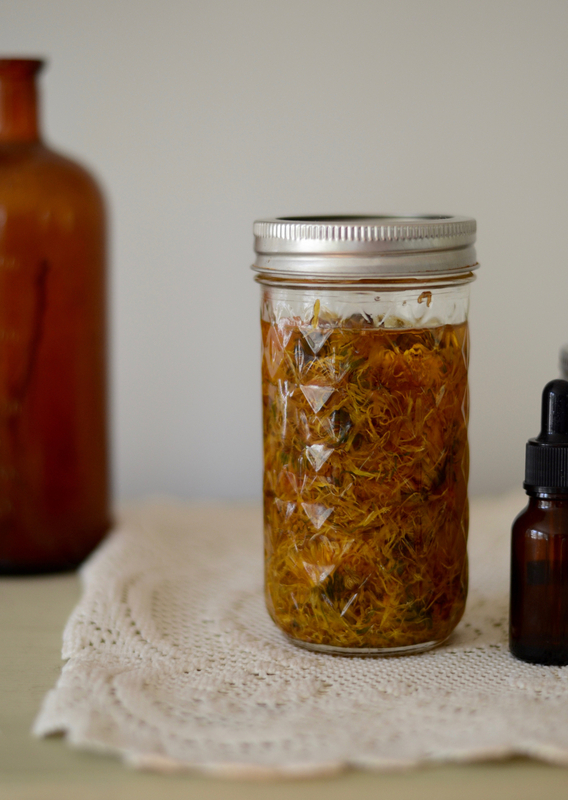 This time around added some beautiful golden infused calendula oil I have been letting warm on our kitchen window sill for a little over a month. Ideally, I wanted it to go a full six weeks before straining, but because calendula has so many soothing and restorative skin healing properties, I added it to this salve as well. I also added Vitamin E oil, and some roman chamomile essential oil too. The beeswax, grapeseed oil, and cocoa/shea butters create a really wonderful remedy that locks in moisture and heals from the inside out. One more thing before I share my all-natural and organic recipe…we have tried everything with Theo regarding store-bought Eczema medicines, creams, and sadly, even steroids. Nothing has worked as well as this salve. I am sure we’ve spent somewhere in the ballpark of several hundred dollars trying to heal his poor skin, and in the end I resorted to making my own products based on a lot of reading and researching skin-soothing ingredients. Plants heal! To prepare, combine all ingredients above, leaving out the essential oils, in a double boiler saucepan. You’ll want a sturdy set specifically for this – look around at thrift stores or secondhand shops to find one! Melt the oils, beeswax, and butters together over medium heat, stirring often. Once everything has melted together, turn off the heat and add the essential oils. You could also add the essential oils into the jar you are storing the salve in if you prefer to do it that way. Just make sure to mix everything after you’ve poured. 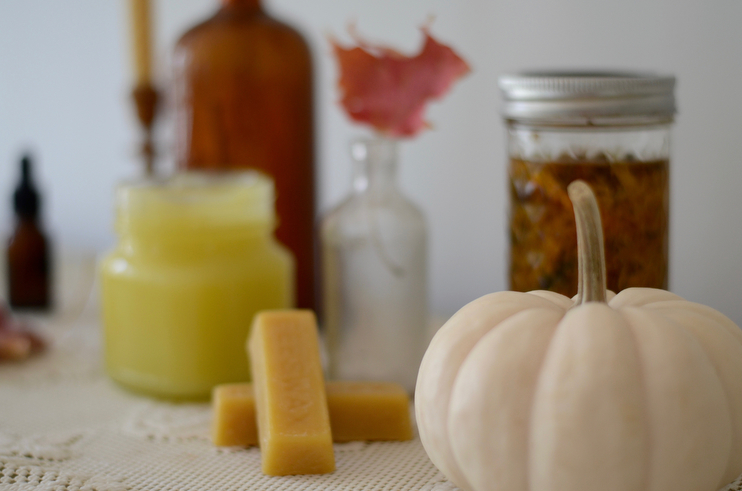 Once you’ve poured the salve into glass jar(s), set it aside overnight to cool and set. This recipe makes a consistency similar to petroleum jelly which is nice for an all-over application. For a thicker consistency, add 1 additional tablespoon of beeswax pellets to this recipe. Even if you do not have eczema but has really dry skin in the colder months, this salve is a good one to have on hand. My legs get really dry in the winter, so I’ll be using this as well, especially after hot baths and steam showers! Do you have little ones who suffer from really sensitive skin or eczema? Isn’t it awful? I am curious to know what kind of remedies and/or lifestyle changes have helped, if any? Thank you for your input, and if you have any questions, I am happy to help answer them! 2. pour organic olive oil in the jar until it fills it, covering all the flowers. 3. Set the jar in a window sill for a few weeks, preferably 4-6, shaking it every so often.